CAPTION: (Left to right) Michele Delisfort, principal and managing partner, Nishuane Group, LLC; Christopher Hartwyk, Orange business administrator; Ernest Williams, chair, HACO; Gerald Haizel, senior associate, Nishuane Group; Assemblyman Thomas Giblin; and Dr. Walter McNeil, HACO executive director. 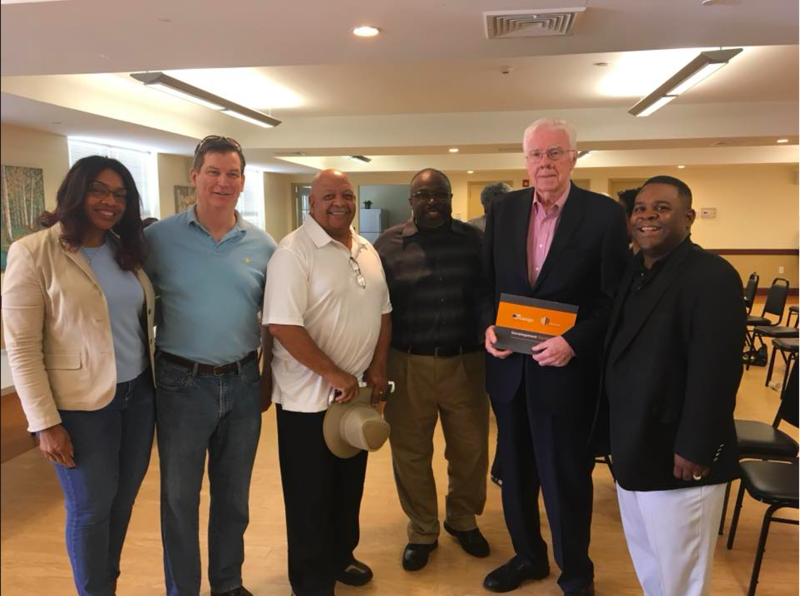 ORANGE, NJ – September 24, 2018 — Housing Authority of the City of Orange was one of participants at the first master plan meeting to take place in Orange in decades, September 22, in the community room at the Walter G. Alexander on Wilson Place. Every municipality in the state is mandated to have a master plan. For the City of Orange, this was an opportunity for the community, including HACO, to come together to strategize for the future. “This is the first time in decades that the city has engaged in a master plan.” Said Christopher Hartwyk, Orange’s business administrator. The meeting was facilitated by Michele Delisfort, principal and managing partner, and Gerald Haizel, senior associate, from the Nishuane Group, urban planners, who researched the proposed plan. The master plan supports a business and entrepreneurial environment that encourages investment in the city. It has several goals: For land use, it seeks to manage each area of the city to enhance residents’ quality of life and increase and maintain property values. For housing, the plan calls for safe, secure, attractive, and affordable housing while increasing the supply of market rate units. One of the major concerns of those gathered was the need to make Orange’s streets and roadways safe, accessible, easy to navigate, and attractive to residents, commuters, and business owners. Residents cited the lack of supermarkets, stores that draw shoppers, the creation of adequate parking, and the need to connect neighborhoods across the Route 280 divide. The city’s rich history was also considered as well. Orange’s historic properties should be enhanced, protected, and showcased with the goal of illustrating the city’s past and instilling pride in the community. Approximately 40 city officials and interested residents attended the Saturday morning session. They were welcomed by Mayor Dwayne Warren who thanked the group for their commitment to the town and the process. The Assemblyman cited public safety, education, and housing as key elements of the plan.